As of 4/28/2014 the Texas Real Estate Commission has released and required everyone to use the new form of the Unimproved Property Contract. Lets look at what has changed and what the unimproved property contract is used for. The unimproved property contract is actually used for land or lot sale purchases. The contract is designed to outline the condition of the lot and other conditions that exist with the land. This contract shouldn’t be used when purchasing or selling a structure that has been built on the land. Lets take a look at the recent revisions to the unimproved property contract in Texas. The first real change of the unimproved property contract is in the Title Policy and Survey section. TREC has removed the statement that the buyer at their expense may have the exception read … when related to the standard discrepancies to the boundary and encroachments. They have now changed this portion to clearly state whether or not the section will be amended, deleted or will remain in tact and whether or not it will be paid for by the buyer or seller. You can see the changes below. 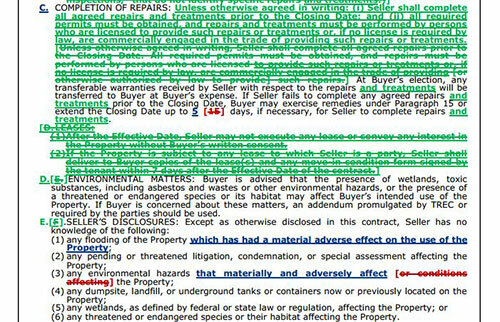 The next notable change to the unimproved property contract 9-11 occurs in the title notes portion. An additional tenth item has been added to the list of title notices to require the seller to notify the purchaser if the land that is being purchased is in a propane gas system area. As per Texas Utilities Code 141.010 and addendum must now be provided to give the additional information. After the addition of the propane gas notice, the following section is about property condition. Here in this version of unimproved property contract 9-11 TREC has provided additional clarification on as-is. The prior version of the contract briefly touched on accepting the land as-is or as-is with outlined modifications or terms. This version now further clarifies as-is and exactly what the purchaser is assuming. This added level of clarity helps avoid misunderstanding and misinterpretations. It also then removes the notice portion. The notice portion is now included in the further disclaimer portion. After the as is portion the Texas real estate commission has now replaced the verbiage in the completion of repairs section. This section appears to cover the same notice but has been modified to provide a more concise message. The wording is clearer and more easily understood. Just under this section there is further clarification about disclosing flooding of the property that has had a material adverse effect. It also adds this clarification to the environmental section. 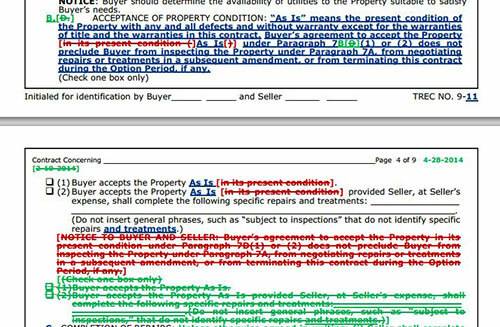 The last notable change to the unimproved property contract is in the closing section of the form. Section 5 of the closing section refers to the property being under a residential lease and the notices that should be given. This section should actually never have been included. This contract is for the sale of vacant land or lots. This means that no residential leases should exist. There are of course obscure cases of a person living in a tent and renting the land or a mobile home there but these cases in general should be handled outside of this portion and require further explanations. After the residential lease portion there is some added disclaimer about this type of land lease though. The lease would need to be disclosed to the purchaser and after the sale the seller would not retain that right to lease. You made it. You actually read through all the exciting changes to the contract and you should be proud of yourself. Most people don’t pay attention to these changes. Having this knowledge and understanding whats changing is what keeps you one step ahead as a real estate professional. 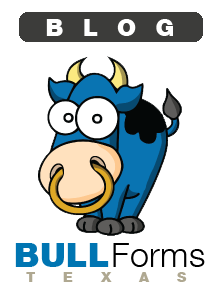 If you are unaware of who we are, we offer a texas real estate form software. Our software allows you to easily complete all of the Texas real estate forms online, send them to clients, have them e-signed and much much more. Sign up to use our free texas residential contract or learn more about our full featured software.